iDisorder: changes to your brain´s ability to process information and your ability to relate to the world due to your daily use of media and technology resulting in signs and symptoms of psychological disorders – such as stress, sleeplessness, and a compulsive need to check in with all of your technology. Based on decades of research and expertise in the “psychology of technology,” Dr. Larry Rosen offers clear, down-to-earth explanations for why many of us are suffering from an “iDisorder.” Rosen offers solid, proven strategies to help us overcome the iDisorder we all feel in our lives while still making use of all that technology offers. Our world is not going to change, and technology will continue to penetrate society even deeper leaving us little chance to react to the seemingly daily additions to our lives. Rosen teaches us how to stay human in an increasingly technological world. NOTE: Matar Cohen, a student at the Fashion Institute of Technology in New York City, developed a short animated commercial for the book that can be see here: http://youtu.be/3EDBpNm9-Kw. Enjoy! By Larry D. Rosen Ph.D.
Release date March 27, 2012. Rosen (California State) is a recognized expert in the “psychology of technology.” As he did with the term “TechnoStress” in his 1997 book by the same name, he has coined the term “iDisorder” to describe society’s growing obsession with technology. Whether it will enter the popular lexicon is hard to say, there there is much about this book that is interesting and important, making it required reading for anyone who divides the day between various electronic devices. Rosen notes that those who routinely engage with devices can be suffering from mood/personality disorders as described in the Diagnostic and Statistical Manual of Mental Disorders (DSM-IV-TR; 4th ed., 2000). He realizes that technology is a permanent part of daily life, but he promotes balance and moderation. 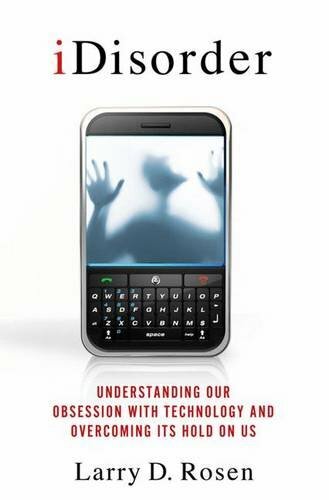 In each chapter, he examines known psychological disorders and links them to technology-affected behaviors. Drawing on behavioral/neurological research, he illustrates why people display “disinhibition” when communicating behind the “safety of our computer screens.” Chapters conclude with basic advice on how to avoid iDisorder. Rosen writes with a wide readership in mind. Though he is not immune to occasional hyperbole or awkward phrasing, these occurrences are few/minor. Valuable for readers interested in their increasingly complex relationship with technology. Summing Up: Highly recommended. All levels/libraries.